The French club’s new owners walked away from talks after failing to agree terms with the former Gunners striker. The Ligue 1 club are about to be bought out by the US investment fund GACP and had hoped to appoint Henry in place of out-going boss Gus Poyet. Talks had reached an advanced stage but Bordeaux then announced in August that the deal was dead, with Brazilian coach Ricardo eventually appointed instead. 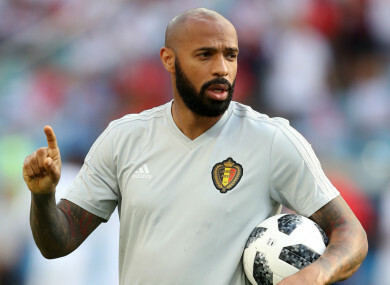 Henry served as assistant to Belgium head coach Roberto Martinez during this summer’s World Cup, and the role at Nuveaux Stade de Bordeaux had looked to be his first job as a number one. Reports claimed he was close to being appointed Aston Villa manager earlier in the summer, but he remains without a managerial role after talks with Bordeaux fell through. “In each business, whether it be a football team, a shop or an insurance company, there are business plans,” GACP head Joe DaGrosa told L’Equipe. “And sometimes that involves taking difficult decisions. We had hoped to reach an agreement with Thierry Henry, but sometimes reasonable people can disagree. That’s what happened. GACP are poised to replace current owners M6 by the end of September, but were not prepared to deviate from their financial model in order to land Henry. Reports in France had earlier alleged that Henry had held reservations over any future balance of power between the football management and the owners, and had broken off talks for footballing reasons. But DaGrosa made it clear that financial matters had proved an insurmountable obstacle. Thierry Henry perhaps had a bad impression of our talks but at the end of our meeting, we made it clear that it was we who were leaving the talks for financial reasons. Email “Bordeaux claim Henry didn't get manager's job for 'financial reasons'”. Feedback on “Bordeaux claim Henry didn't get manager's job for 'financial reasons'”.